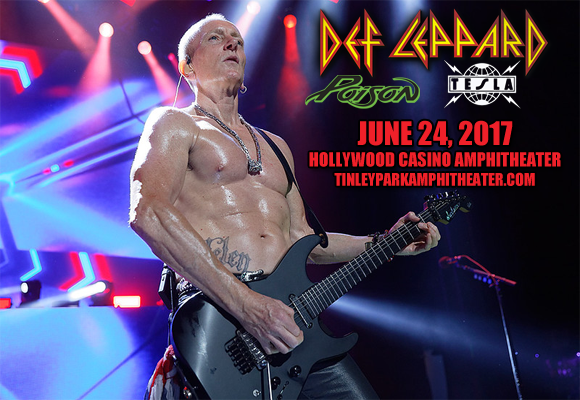 It's the rock show of the year, as glam-rock heavyweights Def Leppard, Poison & Tesla team up for a goliath tour that comes to Hollywood Casino Amphitheatre on Saturday 24th June 2017! One of only five rock groups to have two original albums sell over 10 million copies in the U.S., British rock band Def Leppard have seen huge success on both sides of the pond. Classed as one of the best-selling bands of all time, they have sold over 100 million albums worldwide. Their hugely successful 1987 album Hysteria alone launched seven hit singles including: "Love Bites", alongside "Pour Some Sugar on Me", "Hysteria", "Armageddon It", "Animal", "Rocket", and "Women". The band were inducted into the Rock Walk of Fame in 2000, and they were ranked No. 31 in VH1's "100 Greatest Artists of Hard Rock" and No. 70 in "100 Greatest Artists of All Time".